The photographs comprising Sounds of the Ocean are part of the record and process of Sherry Wiggins’ ongoing interest in the Middle East. In this work, Wiggins interviewed people in both the U.S. and the West Bank of the Occupied Territories of Palestine by transporting questions back and forth to create a form of dialogue and thoughtful observation. 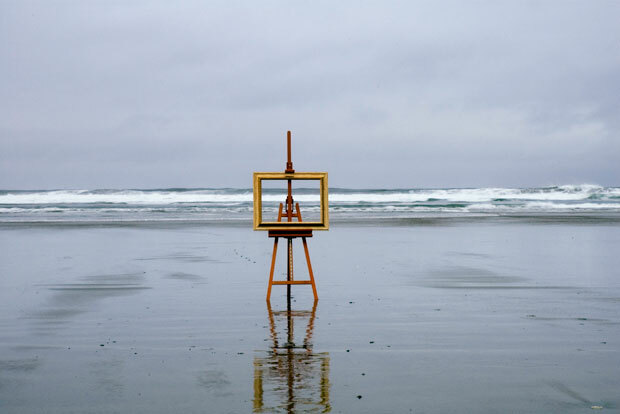 After the interviews and back in the U.S., Wiggins performed a ritual in which she placed an artist’s easel and a golden frame by the ocean. She then placed different objects in the frame to reflect the dreams of the Palestinians with whom she spoke, and recorded the process in digital media. First, she placed the empty golden frame, then a painting of a lemon tree for Suhair, a Palestinian flag for Joseph, and finally, a photograph of Taghrid.